Official App from Eclipse Cinemas. Latest listings of all Movies,and special performances, including detailed event information.Book your tickets from your Android device, get directions to ourcinema, view all of our latest specials, and much more. Add yourticket bookings to your Android's calendar to get notifications andintegrate with your existing schedule. Share events, and bookingson social networks to see who wants to join you in seeing thelatest films at your local Eclipse Cinema. - Powered by the secureAdmit-One Booking Engine. - Location, Phone, and Web Browserpermissions used for extra cinema information only. SD Card usagefor offline image caching, and calendar use for saving bookings toyour device. - This app has limited functionality when anactive/reliable internet connection is not available. Official App from Movies-At Cinemas. Latest listings of all Movieperformances, including detailed event information. Book your seatsfrom your Android device, get directions to our cinemas, view allof our latest specials, and much more. Add your ticket bookings toyour Android calendar to get notifications and integrate with yourexisting schedule. Share events, and bookings on social networks tosee who wants to join you in seeing the latest films at your localMovies-At Cinema. - Powered by the secure Admit-One BookingEngine.c - Location, Phone, and Web Browser permissions used forextra cinema information only. - This app has limited functionalitywhen an active/reliable internet connection is not available. Official App from Century Cinemas - Letterkenny. Latest listings ofall Movies and Event Cinema performances, including detailed eventinformation. Book your tickets from your Android device, getdirections to our cinema, view all of our latest specials, and muchmore. Add your ticket bookings to your Android's calendar to getnotifications and integrate with your existing schedule. Shareevents, and bookings on social networks to see who wants to joinyou in seeing the latest films Century Cinemas. - Powered by thesecure Admit-One Booking Engine. - Location, Phone, and Web Browserpermissions used for extra cinema information only. SD Card usagefor offline image caching, and calendar use for saving bookings toyour device. - This app has limited functionality when anactive/reliable internet connection is not available - GoogleAnalytics included to help up improve our app. You can easily 'OptOut' via the settings screen. Official App from Movies-At Gorey. Latest listings of all Movies,and special performances, including detailed event information.Book your tickets from your Android device, get directions to ourcinema, view all of our latest specials, and much more. Add yourticket bookings to your Android's calendar to get notifications andintegrate with your existing schedule. Share events, and bookingson social networks to see who wants to join you in seeing thelatest films at Movies-At Gorey. - Powered by the secure Admit-OneBooking Engine. - Location, Phone, and Web Browser permissions usedfor extra cinema information only. SD Card usage for offline imagecaching, and calendar use for saving bookings to your device. -This app has limited functionality when an active/reliable internetconnection is not available. - Google Analytics included to help upimprove our app. You can easily 'Opt Out' via the settings screen. Official App from Cinema City. Latest listings of all Movies, andspecial performances, including detailed event information. 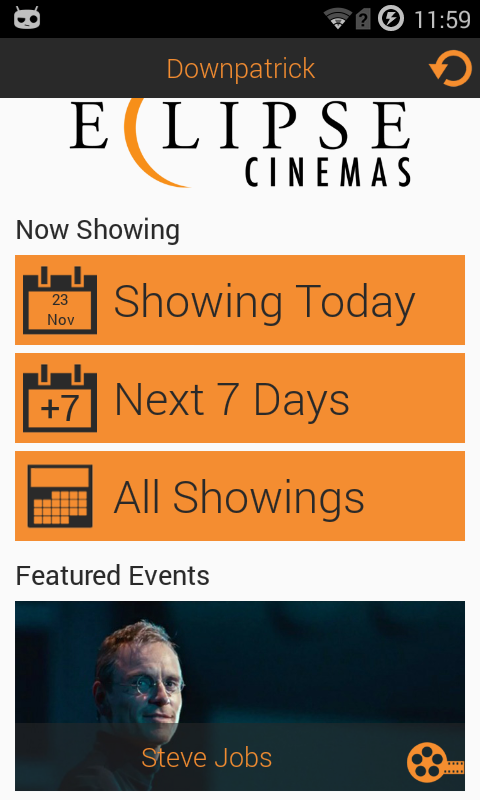 Bookyour tickets from your device, get directions to our cinema, viewall of our latest specials, and much more. Add your ticket bookingsto your device's calendar to get notifications and integrate withyour existing schedule. Share events, and bookings on socialnetworks to see who wants to join you in seeing the latest films atCinema City. - Powered by the secure Admit-One Booking Engine. -Location, Phone, and Web Browser permissions used for extra cinemainformation only. SD Card usage for offline image caching, andcalendar use for saving bookings to your device. - This app haslimited functionality when an active/reliable internet connectionis not available. Official App from the The Rex Cinema Wareham Latest listings of allLive Events, Movies, and special performances, including detailedevent information. Book your tickets from your Android device, getdirections to us, view all of our latest specials, and much more.Add your ticket bookings to your Android's calendar to getnotifications and integrate with your existing schedule. Shareevents, and bookings on social networks to see who wants to joinyou in seeing the latest films at The Rex Cinema. - Powered by thesecure Admit-One Booking Engine. - Location, Phone, and Web Browserpermissions used for extra cinema information only. SD Card usagefor offline image caching, and calendar use for saving bookings toyour device. - This app has limited functionality when anactive/reliable internet connection is not available. - GoogleAnalytics included to help up improve our app. You can easily 'OptOut' via the settings screen. Official App from Showtime Cinemas. Latest listings of all Movies,and special performances, including detailed event information.Book your tickets from your Android device, get directions to ourcinema, view all of our latest specials, and much more.Add yourticket bookings to your Android's calendar to get notifications andintegrate with your existing schedule. Share events, and bookingson social networks to see who wants to join you in seeing thelatest films at your local Showtime Cinema.- Powered by the secureAdmit-One Booking Engine.- Location, Phone, and Web Browserpermissions used for extra cinema information only. SD Card usagefor offline image caching, and calendar use for saving bookings toyour device.- This app has limited functionality when anactive/reliable internet connection is not available.1.2.0.0-Google Analytics included to help up improve our app. You caneasily 'Opt Out' via the settings screen. Official App from Gate Cinemas. Latest listings of all Movies, andspecial performances, including detailed event information. Bookyour tickets from your Android device, get directions to ourcinema, view all of our latest specials, and much more. Add yourticket bookings to your Android's calendar to get notifications andintegrate with your existing schedule. Share events, and bookingson social networks to see who wants to join you in seeing thelatest films at your local Gate Cinema. - Powered by the secureAdmit-One Booking Engine. - Location, Phone, and Web Browserpermissions used for extra cinema information only. SD Card usagefor offline image caching, and calendar use for saving bookings toyour device. - This app has limited functionality when anactive/reliable internet connection is not available - GoogleAnalytics included to help up improve our app. You can easily 'OptOut' via the settings screen. The Movie Tavern app is the easiest and fastest way to checkshowtimes, reserve seats and buy tickets, find locations, andexperience unique content for America’s best cinema eatery: MovieTavern. You no longer need to visit the box office or kiosk, normess around with a printer. No lines and no delays. Just head tothe theater then order from our delicious chef-inspired food menuand full bar choices, all from a plush, comfortable seat youselected in advance. Or stop by our Tavern area (before or after)for a specialty drink, craft beer, or one of our bar events. Nomatter your plans, our warm and engaging servers are ready to makeyour movie experience a great one. Movie Tavern, it’s the bestplace ever to...eat, drink, and be movie! Our movie tickets are now at your fingertips wherever you go! Withthe new app, you can: - Book tickets and Prebook before movies opento public - Check show timings and availability - Choose your seats- Track your order history - Browse movie information such assynopsis, trailers and posters - Pre-order food before your movie -Order food anytime and collect from our Pick and Go counters - Viewour Cinemas and Facilities - Avail offers New Features -Order foodfrom your seat and pick up at our counters -Uber on your ticket -Get a ride! -Swipe left to right on home page to pick films basedon the cinema. -Save your preferences and payment information forconvenience. -You now have the option to add food to an existingbooking. Just go to ‘My History’ and choose the booking ID you wishto add it onto. -Your e-ticket will have all the informationpertaining to your show – time left for your movie to start, maps,food/drink order and show details. The all new PVR APP makes movie booking a seamless and hassle freeexperience. You can now buy your tickets directly on our app. Stayupdated with movie information, movie schedule, upcoming movies,show timings, pre - book food and seats, and get many moreadditional exclusive loyalty benefits. There is something foreveryone! Explore from our diverse range of cinema across genres;1. Bollywood lovers: Choose from the most popular movies, from thebiggest production houses and the most celebrated superstars in theindustry. Unwind with Bollywood movies ranging from drama, action,comedy to romance; catering to everyone’s choice. 2. Hollywoodmovies: Never miss out on any international hits! We bring to youmovies from across the globe, from the best production houses,superstars and genres. Stay ahead with movies ranging from action,comedy, thrillers and suspense simultaneously being aired in theother parts of the world. 3. Regional cinemas: A big shout out toregional cinema lovers! Enjoy movies from all corners of thecountry and the biggest production that cater to all languages andfan bases. From the magic of Rajinikanth to Punjabi super hits,choose your pick! Not only this, to enhance your experience evenfurther we offer a wide range of formats in which you can enjoyyour movies; PVR Director’s Cut PVR Pictures PVR IMAX PVR 4DX. PlayHouse PVR Gold PVR P[XL PVR Onyx The refreshingly new PVR APP, alsoenriches your experience with features like - • Improved Navigation– Easy scrolling and booking of tickets and food. We've improvedthe navigation to help you seamlessly book your movie tickets,food, find the best offers, and to make it easier to book. • ShowEnd Time info – Plan your movie experience well in advance. Thisfeature lets you know the end time of a particular show. • AppPersonalization - Now discover movie recommendations, foodsuggestions, seat preferences, preferred cinema and many moresurprises tailored just for you. • Cab booking – Seamless cabbooking from the app. Book a cab for your movie trip! We've teamedup with OLA to bring you the best taxi service available • TicketCancellations – Tentative plan? No problem, cancel up to 20 minutesbefore the show time. For more information refer to our TnCshttps://www.pvrcinemas.com/termsandconditions • PVR Privilege –.Get set to be rewarded on every transaction you make at PVR Cinemasor on our website. You earn 5 PVR Privilege Points for every INR100 you spend on tickets & food & beverage items. FreeLarge Popcorn (Salted) on your first transaction post enrolment.The goodness doesn't end here; after earning 50 points, youautomatically receive a voucher for the amount. Your vouchers arevalid on subsequent transactions at our cinemas, as well as on ourwebsite and mobile app. That's not all! With PVR Privilegemembership, you get birthday bonuses, invite to exclusive events& premieres and more, to make your movie-going experiencehugely rewarding. • Accessible cinemas (Movies for everyone) –We’re here to help make your movie experience an amazing one. Weprovide closed captioning, or provide narration of the action onscreen (audio description). Our accessible theatres offerwheelchair seating in every auditorium. Please note that not allmovies are with closed captions and/or audio descriptions. Look forshow times with audio description or closed captioning labelsbefore booking • Traffic updates - Now get traffic updates fromyour saved location to PVR Cinema, so you reach on time, and don’tmiss even a moment of the movie you are planning to watch. Apartfrom this, choose from a number of payment options to pay for yourticket! Download the app now to access all these exclusive featuresnow. Movie nights are great fun, but with Cinema Movie Night Kids Partyyou can run your own cinema and have movie nights every day of theweek! Running a cinema business is no easy task, you'll need to beon top of your game if you're going to make a success of it. Thereare many tasks to perform when you're the manager of a cinemacomplex and each one must be done well to keep your customers happyand looking forward to their next time.Your new business needs somefixing up before you can open to the public, nobody likes a mustyold cinema with beat up old seats.Movie goers can find it hard tofind the theatre in the first place! Help guide them to theirchosen cinema in a fun puzzle game then open up the box office andstart selling tickets. You'll need to provide each customer withtheir exact order - 2D or 3D? Luxury seating? And most important ofall, what movie do they want to see? Before they go in, guide themthrough the snack bar - who doesn't like a tasty treat at themovies? And when they're all ready and the movie's begun you'llneed your trusty flashlight to pick out the noisy customers. Why dosome people go to the movies and make so much noise?The movie'sover and it's time to clean up. All those spilled popcorn boxes andcandy wrappers. But don't be surprised if some customers leave morethan they intended, the lost and found is choice full of weird andwonderful items. Don't worry, everyone comes to find their lostproperty sooner or later, just make sure you give them the rightthing!Cinema Movie Night Kids Party makes management fun whileteaching your children all about running their very own business.Key Features:Management skills - There's plenty of scope forchildren to learn about how to manage a busy business.Puzzle games- Every task is a puzzle developing hand eye coordination and logicskills through fun and games.Multitasking - You can't run abusiness like this without being able to do more than one thing ata time!Customer Service - Kids can learn that running a businessisn't just about making money. Being good with people makes all thedifference, from helping them find the theatre to selling them theright ticket and even how to deal with noisy customers gently butfirmly!Help the customers to pay the cashier with the credit cardwhen they buy the film ticket!The movie night will be fantastic inthis movie theater! Remember to clean the cinema and prepare drinks& snacks as Coke and soda in this educational game!Popcorn areso delicious while watching a movie ! And if you lost something, goto lost and found office!Become a future CEO superstar with CinemaMovie Night Kids Party game and give your kids an early start onthe management ladder!Have fun with BestopStudios games! BestEducational fun Games for Kids! Official App from Picturedrome Cinemas. Choose your localPicturedrome Cinema, including: Carlton - Westgate-on-Sea Century -Clacton-on-Sea Luxe - Wisbech Maxime - Blackwood Picturedrome -Bognor Regis Plaza - Dorchester Latest listings of all current andupcoming movies, Event Cinema shows, and special performances,including detailed event information. Book your tickets from yourAndroid device, get directions to our cinemas, view all of ourlatest specials, and much more. Add your ticket bookings to yourAndroid calendar to get notifications and integrate with yourexisting schedule. Share events, and bookings on social networks tosee who wants to join you in seeing the latest films at your localPicturedrome Cinema. - Powered by the secure Admit-One BookingEngine. - This app has limited functionality when anactive/reliable internet connection is not available.